The DKX3-232 Dominion KX III is an enterprise-class KVM-over IP switch that provides 2 users with BIOS-level remote management of 32 servers in a single switch. 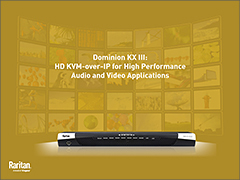 Featuring top quality video performance, solid security, and enhanced reliability, the Dominion KX III offers a powerful solution fit for a variety of configurations. With standard features such as DVI/HDMI/DisplayPort digital video, VGA analog video, audio, virtual media, smart card/CAC, and mobile access, the Dominion KXIII is suitable for both general server applications and dynamic broadcast applications. The Dominion DKX3-232 is ideal for Server Rooms, high quality AV Broadcast, Test Labs, and the Largest Enterprise Data Centers. 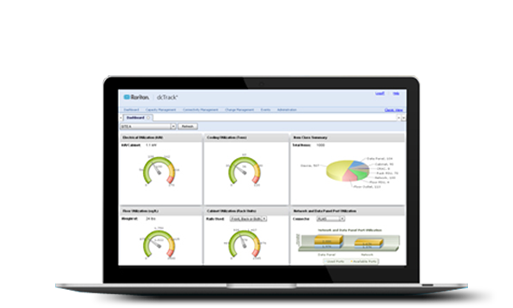 The Raritan KX III offers high performance web-based remote management of servers, PCs, laptops and serial devices with virtually any application. 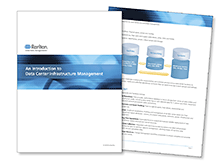 Deploy the switch individually, or centralize with Raritan's CommandCenter Secure Gateway. 30 frames-per-second, 1080p or 1920x1200 video-over-IP (with audio) for broadcast and other video-intensive applications. Get ultra-fast connections and switching with the DKX3-232 model. High performance User Station now available for lab, studio or control room use! The Raritan Dominion KX3 also offer native a Dual Monitor 'follow' mode, which automatically opens up all the relevant displays when connecting to a server. 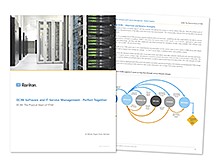 With Raritan's DKX3-232 secure remote access solution, you can meet government and military security mandates, including: AES & FIPS 140-2 encryption, Common Access Card (CAC) authentication, PIV, FIPS 201, HSPD-12 and IPv6 networking. The KX III's next generation video processing engine supports dynamic broadcast applications that require 1920x1200 HD resolution, 24 bit color, digital audio, dual monitors and DVI, HDMI, DisplayPort and VGA video. 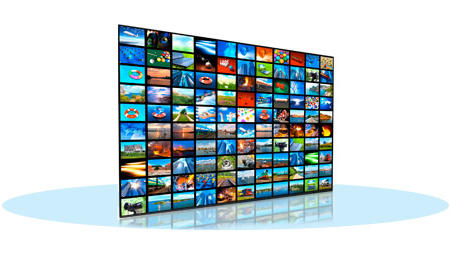 View streaming 1080p video at 30 frames-per-second over your LAN. New high performance IP User Station now available for labs and studios. Fast connections and sub-second switching available with the DKX3-232 model. 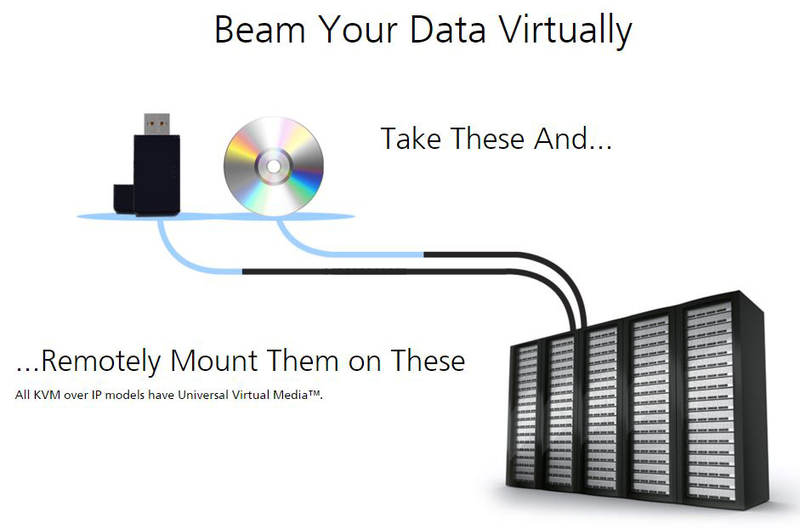 Virtual Media lets the user remotely mount storage devices, CAC readers, printers, bootable ISO, and any other USB devices onto the computers and servers connected to the DKX3-232 KVM Over IP switch. 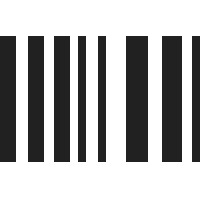 The networked USB device functions as if it was directly attached to the source computer or servers USB port. The Raritan Dominion KX III User Station (DKX3-UST) is an optional self-contained, hassle-free appliance for high performance IP access to servers connected to a Dominion KX III switch in environments where a standalone PC is not wanted. 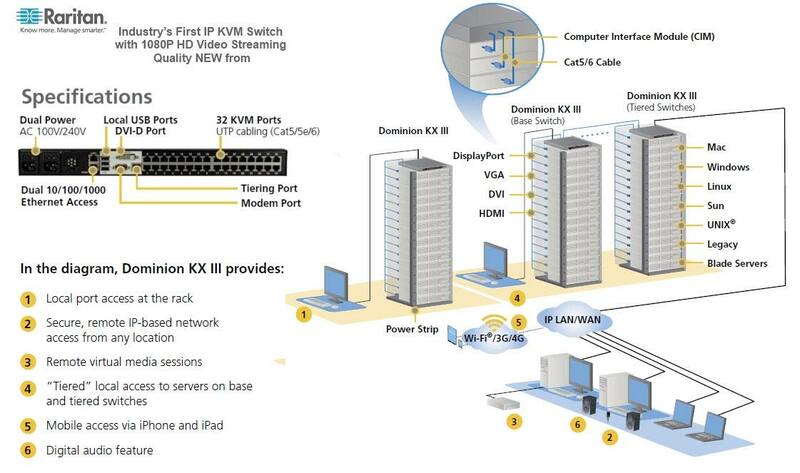 DKX3-UST also supports dual-display applications via its (2) DisplayPort and (1) HDMI video ports. The DSAM modules provide up to 8 ports of true serial access from a Dominion KX III switch. Connect one or two DSAM modules to the DKX3-232 USB ports for Java-free serial access. Manage switches, routers, Linux/Unix servers and other serial devices together with KVM-over-IP access to servers, PC's and workstations. 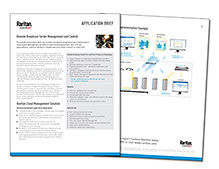 Extend your Raritan DKX3-232 Warranty by 1 to 2 years (up to 4-years total support). Extended warranties include 100% parts and workmanship, 24-hour replacement, and 24-hour technical support. Our system will provide you with a new, personal instance of an online Test Drive - See if the DKX3-232 is right for you! Answer: Thank you for your inquiry. The Dominion KX III requires one Computer Interface Module (CIM) for each attached server as well as CAT5 cable to connect the CIM to the switch. To offer the greatest flexibility, this unit does not come with any CIMs or CAT5 cable. Question: How i can Connect three KVM switches with one LED Monitor for display of all nodes in single monitor? Answer: Thank you for your inquiry. It sounds like you are looking for a multiviewer type KVM that can display the input of multiple systems on a single screen. 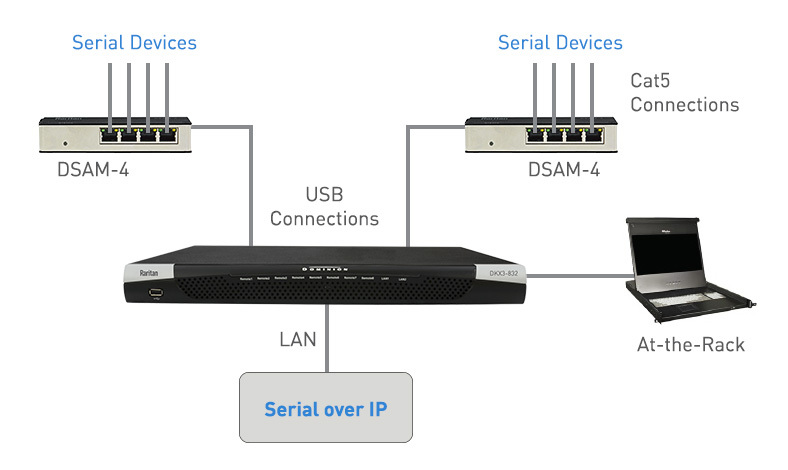 If you have independent keyboards and mice for each system, something like the SmartAVI SM-HDMV-S (https://www.kvm-switches-online.com/sm-hdmv-s.html) might work. For a KVM type device that would share a keyboard and mouse, the Rose Electronics QuadraVista QV-4KVMHDMI ( https://www.kvm-switches-online.com/qv-4kvmhdmi.html ) might work.